NaCCRC | Don't Give Up On Them! 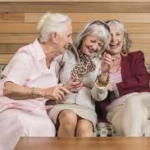 Senior Housing: Who Advocates for the Residents? 74 million Baby Boomers are entering Elderhood and they won’t Age Quietly. While most will age in place, some will transition to Assisted Living or Continuing Care Retirement Communities (CCRCs). The latter require a significant financial investment upfront with care services provided later in a resident’s aging process. Concerned about the financial stability of these entities and the absence of regulations, one advocacy group, the National Continuing Care Residents’ Association has formed and is gaining momentum. With affiliates in nine states and more joining the network, their mission is to assure that “their communities are well-managed and properly regulated.” If your parents or grandparents are in a CCRC, have them check out this organization. Yes, indeed. The Boomers are Coming!